Boys Volleyball Team Win Gold at Zones! Congratulations to our Boys ‘A’ Volleyball team who won gold at the Zone playoffs in Mayerthorpe on Wednesday, Nov. 14. The girls also won Gold as they played at Barrhead Composite High School. They competed against 9 other schools from across northern Alberta so it was a great accomplishment for our boys team. This is far as they can go in Jr. High league so it was a great way to finish off our volleyball season. Special thanks to Howard Gelderman for coaching the boys and for all the parents for driving and coming out to cheer on the team throughout the season. 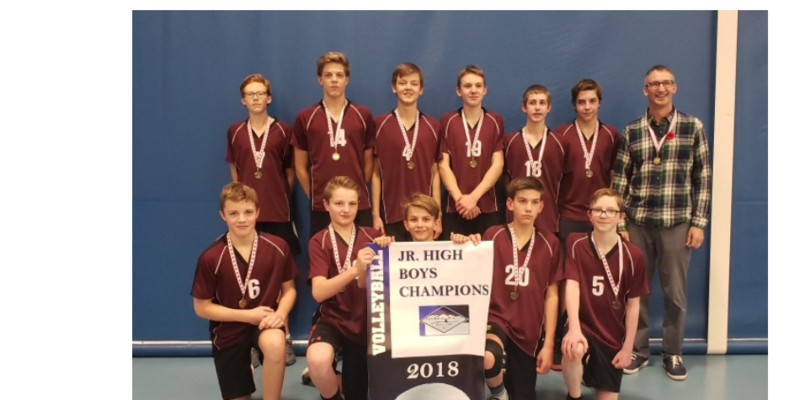 Home / School News / Upcoming Event / Boys Volleyball Team Win Gold at Zones!